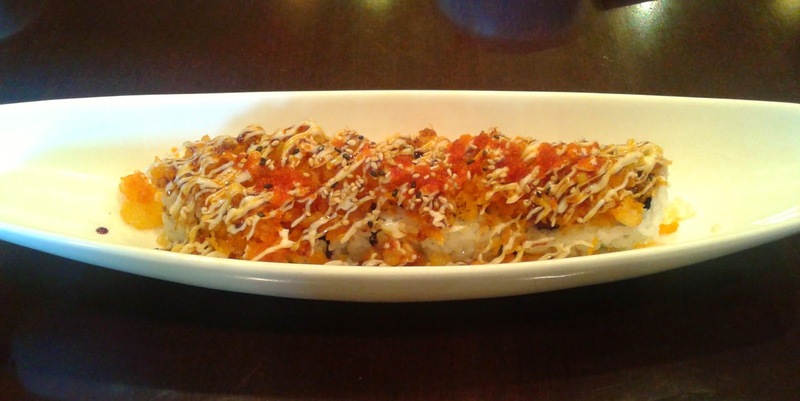 A long time ago, I visited Ki Isu in Yaletown with a friend and we both ended up enjoying the food there. That was way before I started writing this blog, so now, in order to include Ki Isu, I had to choose one of their two locations to visit - Yaletown or West Vancouver. The decision wasn't that hard to make because the West Vancouver location is rated 2% higher on Urbanspoon. So here I was, napping on buses for nearly two hours just to get to that 2%-better sushi. At least I was using that time wisely. 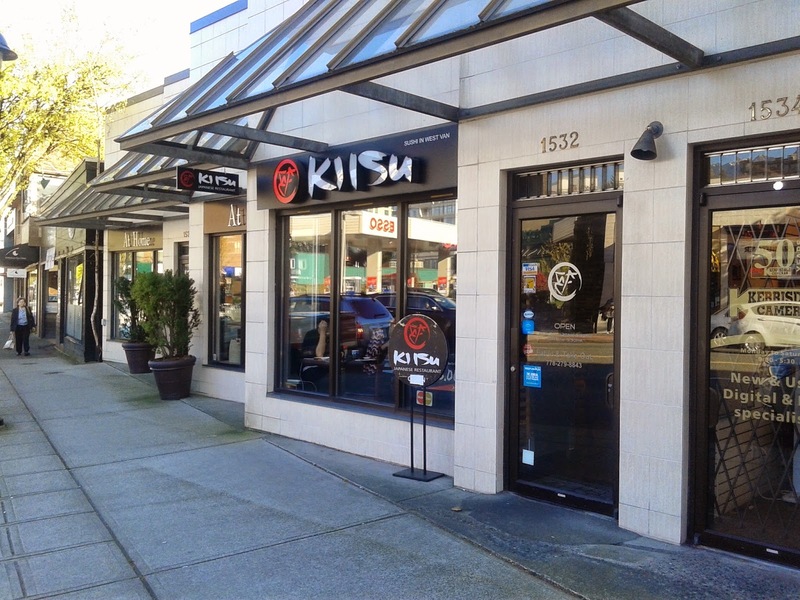 Ki Isu is a Korean-operated Japanese restaurant and is one of the more affordable sushi places in West Vancouver with a large assortment of fusion items on the menu. The atmosphere of the restaurant was quite lively even at half past five, and by 6, there were people waiting for seats and the waitresses were running around the restaurant at an almost-comical speed. The restaurant wasn't even that large, so I'm not sure how much running around actually helped. I'll give credit to the waitresses for not dropping any of the dishes and for only making me raise my hand for 5 minutes to place my order. 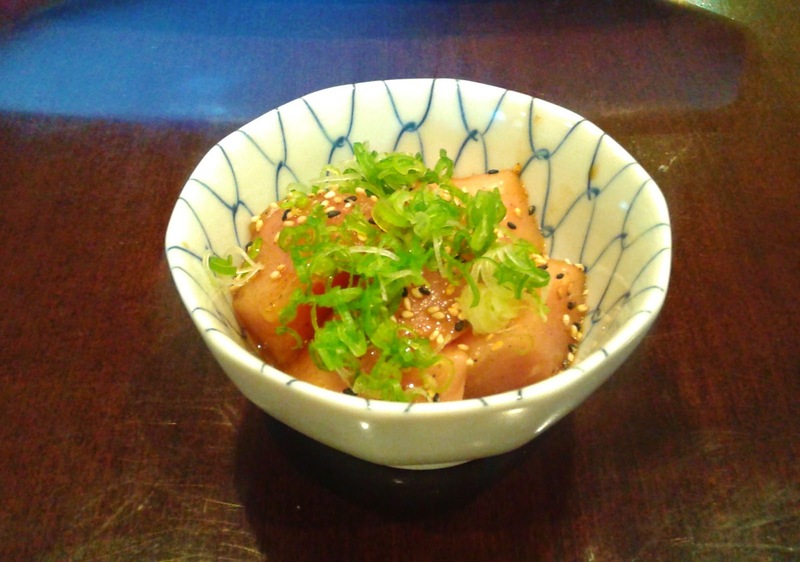 The Tuna Goma-ae came with five rather large pieces of Albacore tuna with scallions draped on top. There was no spinach, but there was more than enough tuna to justify the $4.95 price tag. The tuna was a bit on the colder side, but maintained a soft texture and went well with the well-balanced sesame dressing. I've never seen Salmon Nuggets before, so my expectations were quite low - I would be satisfied as long as they were better than McNuggets. When they first arrived, they looked like a bad case of messed-up gyoza, but it didn't take me long to get addicted to them. The salmon was deliciously juicy and the batter was crispy and not hard at all. The level of spiciness was just right and did not overwhelm the flavour of the salmon. The Crunch Crunch Roll (B's Roll) (half order pictured above) consisted of tempura bits, masago, and tuna dressed in mayonnaise. Don't ask me what B stands for - all I can tell you is that it's better than a B. Inside the roll, the seaweed-mayonnaise combo was tasty and the tuna was sufficiently soft. The tempura bits were a bit large, but overall, the flavours worked nicely together in this neatly constructed roll. While most of the items on the menu are moderately priced, the nigiri sushi is curiously luxury-priced. The one piece of Unagi Nigiri in the picture above cost me $3.95. I originally wanted to get a piece of Anago Nigiri too (because two pieces of nigiri on a plate makes for a more attractive photo), but unfortunately, they were sold out of anago. 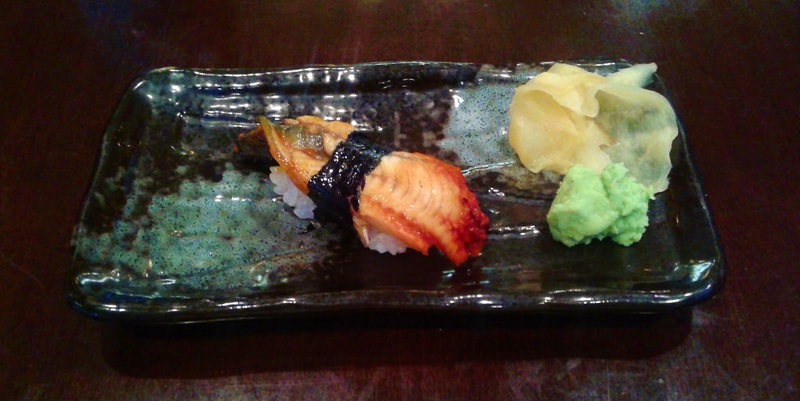 The unagi was decent with a nice smoked flavour, but it wasn't tantalizing enough to be worth $3.95. For the last item of my dinner, I got the Brown Rice Salmon Cake, which consisted of brown rice stacked with crunch, avocado salad, tangy jalapeño salmon, and kizami nori (seaweed). The server told me that they ran out of brown rice, so technically, I got the "Black Rice Salmon Cake" instead. I enjoyed the sweet, creamy flavour of the avocado and the salmon, but the black rice underneath made everything too sweet. It would be nice if they held back on the amount of black rice to put under each piece (or if they bought more brown rice so they wouldn't run out before prime dinner time). The quality of service was acceptable, but was limited by how busy the servers were. Some of the diners around me began to feel sorry for the two servers, seeing how overworked they were. Other than that, it was a pleasant visit with plenty of well-crafted food that exceeded my expectations. The decent food and reasonable prices are what brings so many locals to Ki Isu. It looks like Urbanspoon made the correct choice for me!